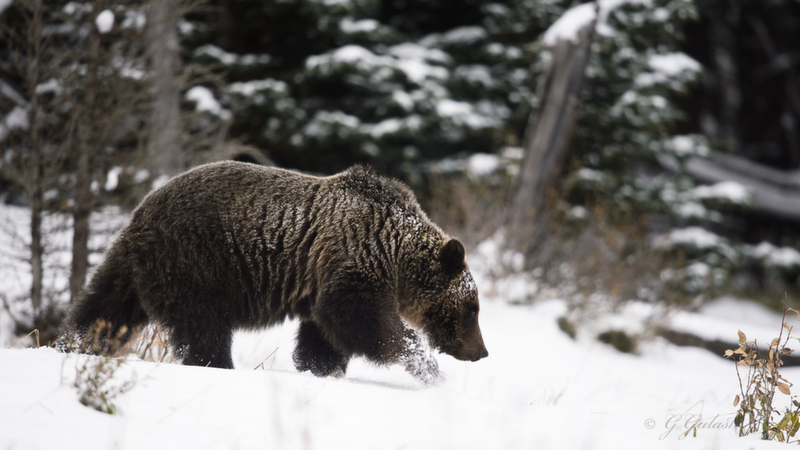 Great photo of grizzly in snow ... in September yet! Pretty cool stuff. Great find and capture, the bear seems to be well prepared for hibernation. A bear on a mission, head down and somewhere to go. This image gives a real feel of the cold and dark days of winter when the sun doesn't make it through. Well done, great mood, Gary. Gary, great mid-stride capture and excellent implied motion with the raised forepaw kicking up the snow. A handsome image of this Grizzly. A nice image of a powerful animal! I might try to lighten some of the dark areas, especially to bring out more details on the face.